Featuring our highest resolution display, hand-crafted font Bookerly, and a new typesetting engine for even more beautiful rendering of pages. Our best-selling Kindle is now even better. 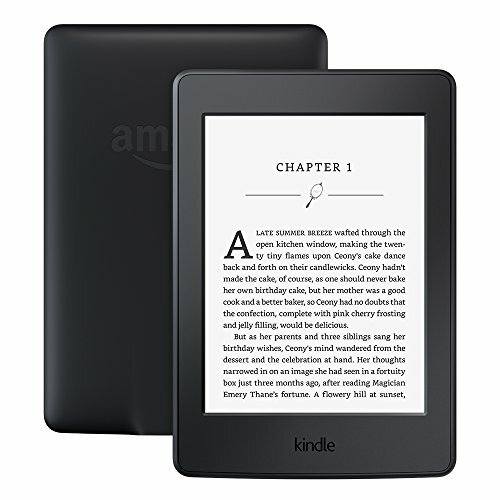 With twice as many pixels as the previous generation, the all-new Kindle Paperwhite has an improved high-resolution 300 ppi display for crisp, laser quality text. 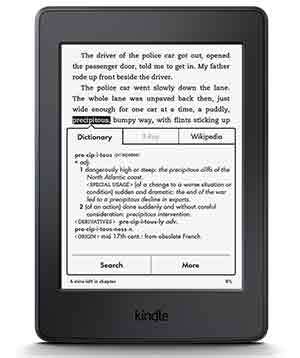 No other e-reader offers a higher resolution display. Kindle Paperwhite offers Bookerly, an exclusive font crafted from the ground up for reading on digital screens. Warm and contemporary, Bookerly is inspired by the artistry of the best fonts in modern print books, but is hand-crafted for great readability at any font size. Typesetting engine lays out words just as the author intended for beautiful rendering of pages. With improved character spacing and the addition of hyphenation, justification, kerning, ligatures, and drop cap support, our best-in-class typography helps you read faster with less eyestrain. Enjoy reading with larger font sizes without compromising your reading experience. Page layout and margins automatically adapt to work well at even the largest font sizes. The new typography and layout improvements are available on over half a million books, including many best sellers, with thousands more being added every week. Unlike reflective tablet and smartphone screens, the latest Kindle Paperwhite reads like paper. 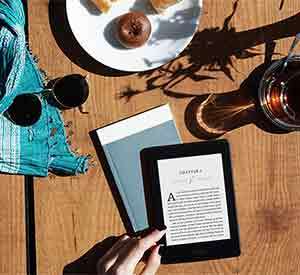 Kindle Paperwhite guides light toward the surface of the display with its built-in front light—so you can read comfortably without eyestrain. Adjust your screen's brightness for great reading in any light. Lighter than a paperback, comfortably hold Kindle Paperwhite in one hand for those times when you can't put the book down. By design, Kindle Paperwhite is purpose-built for reading and creates a sanctuary so you can lose yourself in a book. Unlike tablets and phones, Kindle doesn't distract you with social media, emails, and text messages. Over a million titles are priced at $2.99 or less. Over 2 million titles are $9.99 or less. 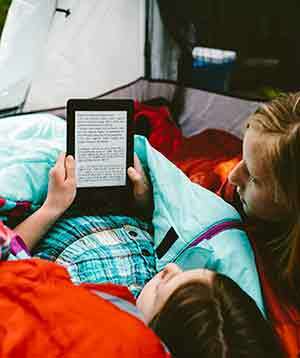 Kids can read books in a simple, fun, and safe environment designed specifically for them with Kindle FreeTime. Kids are rewarded with achievement badges when they reach their reading milestones. A progress report keeps parents updated on total time spent reading, number of words looked up, badges earned, and books read.